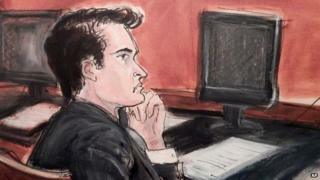 The man accused of operating Silk Road, a deep web marketplace where illegal drugs were sold, has been found guilty. Ross Ulbricht, 30, was convicted by a Manhattan jury on all seven counts including narcotics and money laundering conspiracies. His defence lawyers had argued he was framed for much of the site's activity and had quit the site. The jury deliberated less than day before handing down the verdict, which leaves Ulbricht facing a possible life sentence. US Attorney Preet Bharara said the conviction sent a clear message: "The supposed anonymity of the dark web is not a protective shield from arrest and prosecution." This was a swift and damning verdict, and represents a significant victory for federal prosecutors after a meticulously planned sting. But this trial was always about far more than one individual or even a website. The Silk Road, a site once seen as the poster-child for truly anonymous black market e-commerce, has been destroyed and its mastermind punished. Officials say the outcome sends a clear message to others. But with millions of dollars amassed by Ulbricht in just two years, the online underworld was and remains a lucrative arena. It is a fluid, mercurial environment. Within days of its closure in 2013, other Silk-Road rivals emerged in what has become a depressing game of "whack-a-mole" for the authorities. Collectively, the only lesson these sites appear to have learnt thus far: the need for caution. Today's "darknet" administrators are more guarded in their dealings with their customers. Whether today's verdict will prompt them to revise their strategy more widely is questionable. Defence lawyer Joshua Dratel argued in closing statements that Ulbricht had started Silk Road but quit soon after creating it. The trial had heard that Ulbricht was the "perfect fall guy" for the true owners of the website. But Assistant US Attorney Serrin Turner argued Ulbricht was willing to do anything to protect Silk Road. Emails showed a man willing to spend hundreds of thousands of dollars on contracted killings to remove threats from the operation, the lawyer said. Ulbricht was arrested in October 2013 and had pleaded not guilty to seven charges of narcotics trafficking, criminal enterprise, computer hacking and money laundering. When the verdict was announced, his father dropped his head in his hands and his mother left the courtroom complaining that the defence had been barred from producing evidence that would help her son. Silk Road: Will cybercrime evolve in wake of takedown?